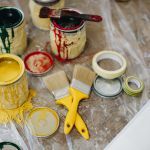 Fear of making costly mistakes or ending up with disappointing results can often mean home decorating jobs are left on the to-do list. Black Friday has become synonymous with cut-price deals – but one retailer is pulling out of the annual event. Baking and knitting are no match for painting when it comes to finding out the UK's favourite craft hobby. It's last place you'd find a car – but the garage often becomes a dumping ground for everything else that doesn't fit in the house. When it comes to making a house a home, it seems there's just one method: a fresh lick of paint.